It's also Saturday PhotoHunt! Today's word is STUCK. Looks like I'm stuck in the middle. Today's a very special day at the townhouse. It's our Anniversagotchary. Ok, try and say THAT 10 times fast without it sounding like something that needs to be treated with antibiotics. I'm told it was TEN years ago today that Glogirly and Gloman became Glogirly and Gloman. 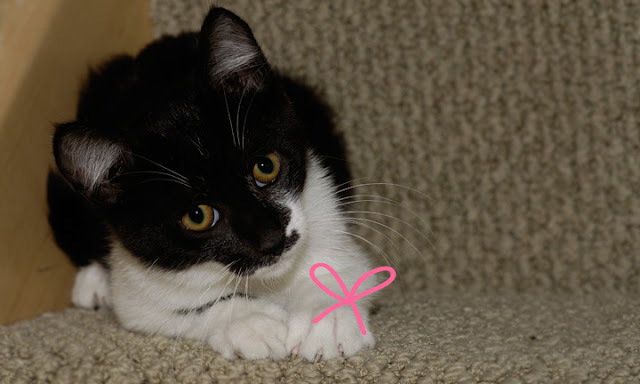 And...it was SEVEN years ago today that Gloman adopted an adorably sassy kitten to bring home to his girl. Gotta give him credit, that was a VERY smart move on his part. Nothing says true-love like an adorable kitten. Especially when it comes wrapped with a pretty ribbon, straight from the arms of a self-proclaimed dog-person. So let's just jump right to the good stuff. Presents. Since I feel a certain obligatory gratitude to Gloman for picking ME, I like to do something special for him each year. He and I share a certain appreciation for fine cuisine snacks. Happy Anniversary Glogirly and Gloman! Wishing you many blessing and more kitties! Um...do you mind if I take a lick of that mayo? Happy Anniversagotchary, Gloman, Glogirly, and Katie! You three were made fur each other. That gift is looking pretty yummy, Katie you have excellent taste. Have a great day! 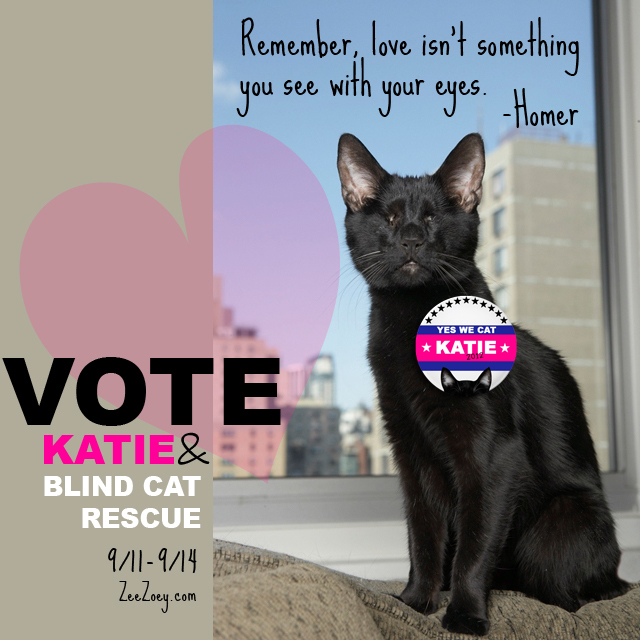 Pee Ess - Vote Katie! Happy Anniversagotchary! We hope you have many more with your mom and dad. Rats, I ran out of PINK. Concatulations to all 3 of you! Happy Anniversagotchary!! And many, many, many mooooore!! Happy gotcha day, Katie, and happy anniversary to your humans! My human says that the best gift she could ever get would be if her dog-person boyfriend would get himself a cat instead of a dog next time he adopts! We hope you all have a very special day with your gotcha day and your humans anniversary. 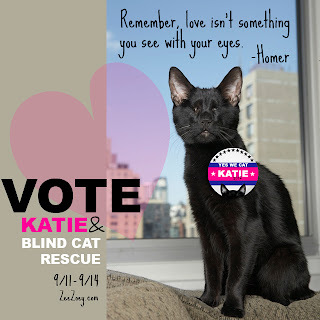 Katie, happy anniversary to your human servants and happy gotcha day to you! We hope you all have a wonderful celebration! Happy annviersarygotcha...word thingy to you! We can't even say it 1 time slow...can't imagine saying it 10 times fast! A very Happy gotcha day Katie. We are not going to attempt that long long word. So have a good anniversary. Great looking pressies. Hope you have a great day and many more. Happy Anniversary you two special ones!!! Happy Anniblogogotchadversity-expealidocious! Yeah, that's how you say it! We are so happy you are all together. Kippers for everyone! Happy Anniversagotcha Day so glad you all are together in a wonderful furever home!!! Are you kidding? We can't even say that one time, let alone 10. But happy annigotcha to all! Just make sure it is HAPPY!!! Give that Gloman a special hug from us......he's one SMART man! We can see why you fell in love with him and vice versa! Happy Anniversagotchary day! We're glad you gotcha'd each other!! Happy 10th anniversary and Happy 7th Gotcha Day Glogirly and Katie!! Katie, Sassy here since the Spotted Airhead has been CatNapped, I get to use the 'puter. Happy anniverigotcha day. Gloman certainly made a good choice in gifts seven years ago! And now he will never forget his anniversary since it falls on the all important gotcha day! Happy, Happy, HAPPY Anniversagotchary!! I can't really pronounce that, let alone say it ten times fast, MOL. But I do think it's way cool that you get to celebrate two amazing events on one day!! I have a fun quiz up on my blog, if you have time, please stop by! Time for sammin smoothies with a nip chaser. For all! We are sure Gloman appreciates the snacks, boy he sure was smart to pick you. 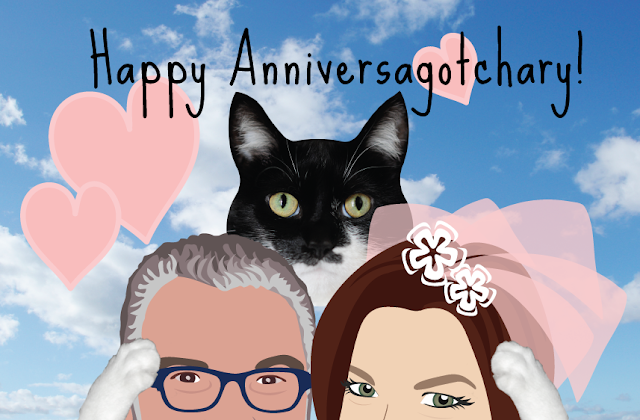 Happy Annigotchaversary! (Or whatever) We're wishing you all many, many more happy years Nothing says it better than mayo, kippers & crackers! Happy Anniversary to Glogirly and Gloman, and HAPPY BIRTHDAY to Katie!!!!! We hope there was some salmon among those gifts! Happy Gotcha Day Katie! You must be the same age as I am. In January I will have been gotten 7 years but I was a few months old. Oh yeah, Happy Anniversary to the Glo's. 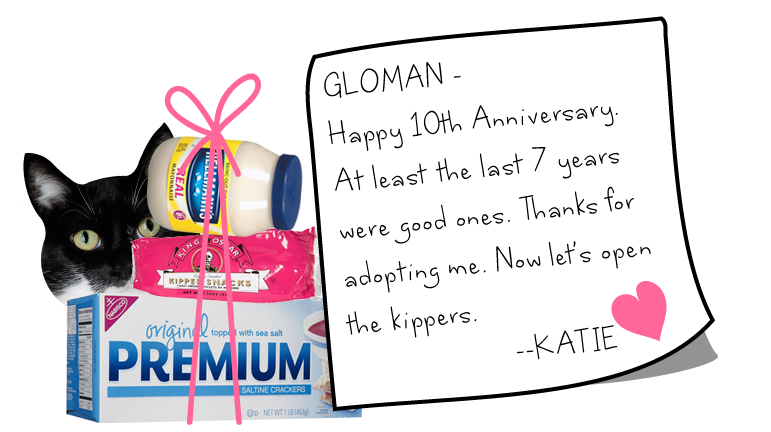 Happy Anniversagotchary Gloman and Glogirly, and Happy Gotcha Katie! Katie what a super special day for the Glo-family with you as the star that made the family complete. Concats!! That is a lot to celebrate in one day!! Happy Anniversary! And Gotcha Day! Double celebrations! Funny, I too was a present for my human, from her then boyfriend, now husband!